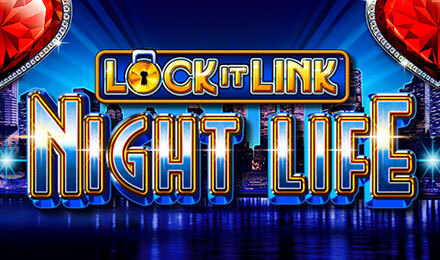 Gear up for a great night on Lock It Link- Night Life slots! Enjoy low stakes, 50 paylines and bonus rounds to enhance your gameplay. WMS’s new game offers exceptional bonuses for you to binge on. Lock It Link- Night life is as you guess, themed around the excitement and thrill of a great night out. Having 5 reels and 50 paylines, this slot game will engage you in the gameplay fully. The high definition graphics and sound of this game will surely impress you. Along with the gleaming graphics, you will find out that bets can be made as from £0.50 to £50.00. Get lucky on the two bonus rounds: Lock It or Free Spins. On landing the bonus symbol, you’ll have the choice between one of the two you’d like to put to play.